Ubu has asked me to design a spawn for the cities server and I decided to give our community a way to contribute to the server and make a few diamonds. We will leave the contest open until one week from now and the winner will receive 45 diamonds. The rules are simple build a ship that can be used as a spawn. If we pick a winner but want multiple of the ships around spawn anyone that is selected will receive prizes as well. Fyyrian its looking good keep it up. Bugsblock told me to upload this for him. Thanks marve. I'll be on all day if you want to see it in person brb. The boats I have seen all look great. We have 2 days left for the contest. First attempt ever at building a boat. It is at 450x 890z in creative (because I is computer illiterate and CANNOT POST A DAMN PIC LOL ARGH). lordbobx is this your boat? Woho, yes! The one with the smoke stack. But seems to be missing some things, like there should be banners on the sides of the stack, and item frames at the helm. Nice boat. The contest ends today. I will be looking at each boat that I know of. If you have not shown me where the boat is please list coordinates and I'll review them later. I just started on this boat today http://imgur.com/a/Qe0P8/ but would like to work on it some more, in particular the sail and interior. It's on the creative map. OK try and get it done as soon as you can and I'll make sure its the last one I check out in a couple days. Mine is at /warp AshShip I believe the warp is! I'm currently on vacation but yeah.. Mine is /warp bugsship. Follow the signs and go into random doors to see all of it. 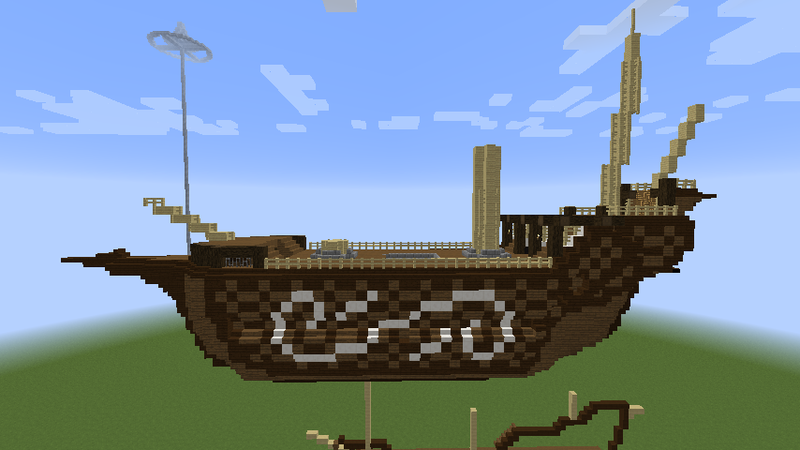 Mine is at warp "eboat" on Creative. I was aiming more for realism than aesthetics. I almost gave up after seeing ehickey's boat. My hollow boat is at warp joeboat. After looking at the boats they are all good besides Ehickey's because his doesn't even move. Ash's is beautiful and is the one I feel would be best for spawn, but since it was made on another server and not in the time allowed for this contest I cannot give the diamonds to him. What I have decided to do is split the diamonds from the prize among the members that built for this contest with larger amounts going to the better ships. We would like to promote the cities server, so does everyone feel contests for builds related to a city would be a good idea? I think contest like this for the cities server would be a good idea. Would encourage people like me who have tons of plans for builds only on the survival server to come up with stuff for the cities server. Mine moves, it just takes some worldedit commands to move it. Hey brb, can I do the rules for the cities spawn? Is Cities going to be in Creative mode? Sure bugs. And cities was the server with the economy plugin and other things. Would everyone rather it be creative? How exactly is the spawn going to be done and how will the ships be used? The idea I had in my head was having the actual spawn inside the ship and then as you go through the rules and everything and make your to the top deck of the ship you are welcomed by a small area of ocean with some if not all of the other ships from the contest in the water. You cannot leave the ship but have a good view of all of the other contest builds, you can use a warp or command block button which then takes you to another location on dry land ready for you to get started on your adventure! Pretty much what you described. I figured I would setup a command block teleport system to take players to each city and have a system to teleport people back to the ship. After reviewing the boats I have been able to determine prizes for everyone. Honorable mention eHickey for the boatiest boat earns a brand new boat complete with no brakes! If I missed anyone sorry please let me know.